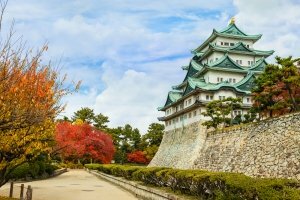 The fourth most populated Japanese city, Nagoya is a principal metropolis that started out as a castle town during the Edo Period, and is now one of the country’s busiest urban hubs. 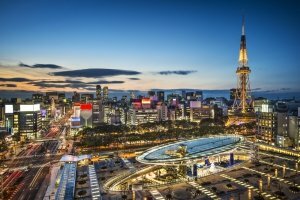 It is home to one of the most important ports in Japan and is also the headquarters of automobile manufacturing giant, Toyota Motor Corporation. Thousands of cherry blossom trees are found in Nagoya, so the city becomes a gorgeous scene of white and pink when springtime comes (March – May). During the summer (June – August), the city experiences hot and humid weather, so indoor activities such as visiting museums are recommended. In autumn (September – November), autumn leaves viewing is a popular activity among locals and tourists, so be ready for crowds in parks and other viewing spots. In winter (December – February), much of the city is colourfully illuminated. To celebrate the Chinese New Year, it becomes even brighter, with lots of red and yellow lanterns and decorations everywhere. Built in the early 1600s, Nagoya Castle served as one of the seats of the Tokugawa clan during the Edo Period. Most of it, including the main palace and castle keep, were destroyed during the war in 1945, and had to be rebuilt. Nowadays, the palace’s entrance, main hall, and other rooms have been completely reconstructed and are open to visitors. The Tokugawa Art Museum used to be the residence of the Owari during the Tokugawa Period. Today, it is home to a wide collection of samurai swords, armour, noh costumes and masks, scrolls, maps, utensils, poems, and other treasures. Outside, there is a traditional Japanese garden with a pond. The complex also consists of many walking trails, bridges, rest houses, and a tea house. Nagoya City Science Museum – With a large, prominent silver globe on its façade, the Nagoya City Museum stands out among all the landmarks of the city. It consists of seven storeys that house a variety of temporary and permanent exhibits, such as “Deep Freezing Lab”, “Electric Discharge Lab” and “Tornado Lab”. Toyota Museums – There are three Toyota Museums in Nagoya — the Kainkan Museum, which is the meeting place for the Toyota plant tour; the Toyota Automobile Museum, which showcases many American and European car models from the 1800s up to the 1960s; and the Toyota Techno Museum, which offers a look at the beginnings of the Toyota company, from being a manufacturer of textile machinery to one of the world’s leading car producers. 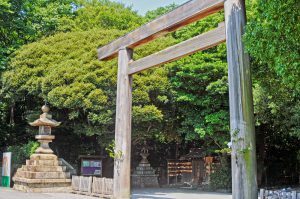 Atsuta Shrine – An important Shinto shrine, Atsuta Shrine is dedicated to Amaterasu, the Sun Goddess, and it is where the Kusanagi, an element of sacred imperial regalia (also known as the Three Sacred Treasures of Japan), is kept. It is surrounded by lush park grounds, with a restaurant that serves the local specialty, kishimen noodles. 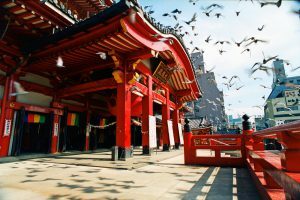 Osu Kannon Temple – Centrally located in Nagoya, Osu Kannon is a Buddhist temple that holds many national properties and treasures, such as the oldest copy of the Kojiki. It is next to a shopping arcade that has many restaurants and shops. Nagoya’s Tokugawa Garden is a large Japanese-style landscape garden that has several walking trails, rest houses, bridges and a central pond. It is a popular destination in the city in spring when its peonies and irises are in full bloom, as well as in autumn when the leaves have turned to a beautiful mix of oranges, reds and yellows. Nagoya Port Area – Nagoya Port is one of the largest in Japan. It is where you can find the Port of Nagoya Public Aquarium, the Fuji Icebreaker, Sea Train Land Amusement Park, and Fuji Antarctic Museum. Sakae – Only two kilometres away from Nagoya Station lies the city’s downtown area called Sakae. It has a diverse selection of malls and stores, such as Oasis 21, and restaurants. Osu Shopping Street – Located next to the Osu Kannon Buddhist Temple in Nagoya, the Osu Shopping Street is a busy shopping arcade boasting more than 400 boutiques, shops, cafes and restaurants. It is frequently described as Nagoya’s own Akihabara because many stores offer anime, electronics, J-pop and cosplay products. There are six subway lines and numerous bus lines that run in Nagoya. For tourists, there is a loop bus service that connects the city’s top tourist destinations.